Most people want to age at home. With simple, common-sense changes to their homes, most people can. This new book tells how. “You’ll find it sensible, useful, comprehensive and engagingly written,” says Paula Span of The New York Times’ The New Old Age blog. “An invaluable, well-researched, well-organized, well-written resource for both people getting older and those concerned about their care, health and safety. As a medical researcher, I applaud its focus on movement as the key to independence,” says Dr. Joan Vernikos, former Director of NASA’s Life Sciences Division and author, Sitting Kills, Moving Heals. 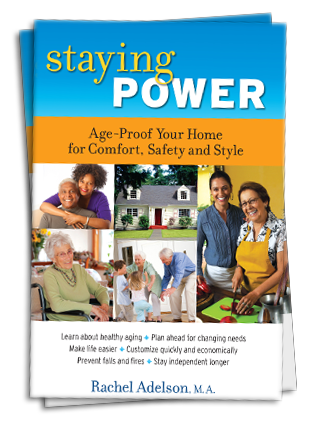 Staying Power: Age-Proof Your Home for Comfort, Safety and Style offers simple solutions for common challenges. This lively, practical handbook can help you and the people you care about stay productive and independent in familiar surroundings. Aging in place doesn’t have to break your back or your budget. Whether you’re an older adult, family helper or elder-care professional, Staying Power: Age-Proof Your Home for Comfort, Safety and Style can help you understand the process of aging and make scores of simple changes that support independence – in nearly any type of house, apartment or condo. Packed with checklists, shopping lists and more than a hundred key resources in the United States and Canada! Paperback: 240 pages. Indexed.